I have numerous projects to complete prior to Christmas, and so without too much procrastination, the machine has been whirring away at constant speed, and I have a finished quilt to show for it. This is a custom quilt; one of two quilts ordered by a customer as a Christmas present for her teenage daughters. I think I have fulfilled my customer's vision of a happy and colorful quilt; one certainly suitable for many more years to come. 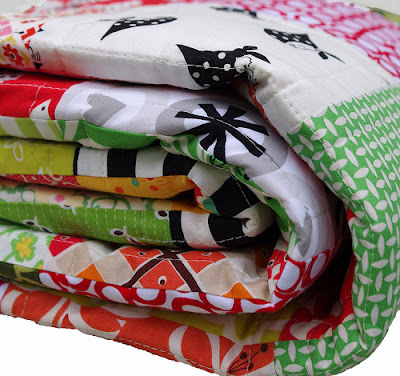 An overload of favorite fabrics, many of which you probably recognize at an instant. I really do enjoy mixing fabrics together from numerous fabric collections and different designers (as well as working from stash fabric). And ... I've used a striped fabric for binding - no surprises here! - this print by Australian fabric company A Day in the Country. And ... for the back of the quilt an injection of color by adding two rows of pieced squares all of which compliment the front of the quilt. You can also see the quilting grid that has emerged; edge to edge stitching, outlining all seam lines, this time a little further apart than my standard 1/2 inch. The fabrics were cut as 5.5 inch squares, a total of 180 squares. The finished quilt measures 60.5 inches x 75.5 inches. One quilt finished, one to go. It's absolutely beautiful! I love how colorful it is and the binding couldn't be more perfect! How do you get quilts done so quickly? I'm amazed! As always, you have done superior quilting Rita. Gorgeous. Like Emily said above me, I am so impressed with your ability to mix and match fabrics! gorgeous - so fresh and vibrant! I think you just sold me on red + green! Very fun and I love how you pull stashed fabrics and mix with new ones. You've got a way with arranging colors! This looks lovely. The colours mix is fab! It totally fulfills the happy colourful vision! I'm sure it will satisfy! 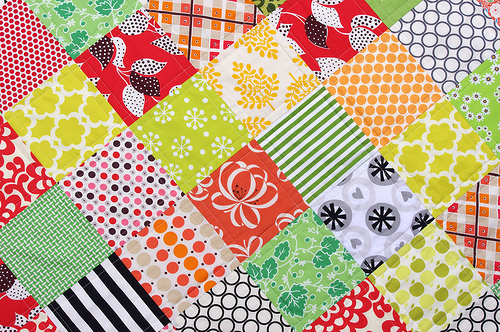 Love the look of your finished quilt. I may try to do something like this mixing in some of my christmas fabrics. Thank you so much for the inspiration! I would love to have slept under this as a teenager...such a lucky girl...can't wait to see what you make for her sister(I assume they are sisters). 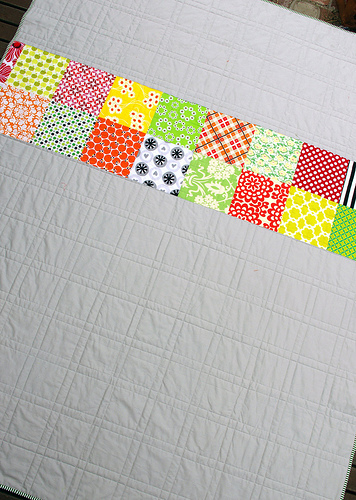 love the modern straight quilting especially how it looks on the back! Lovely.... The color just sings happy. Love the colour combination! Kind of Christmassy and summery all at the same time. Just like that! 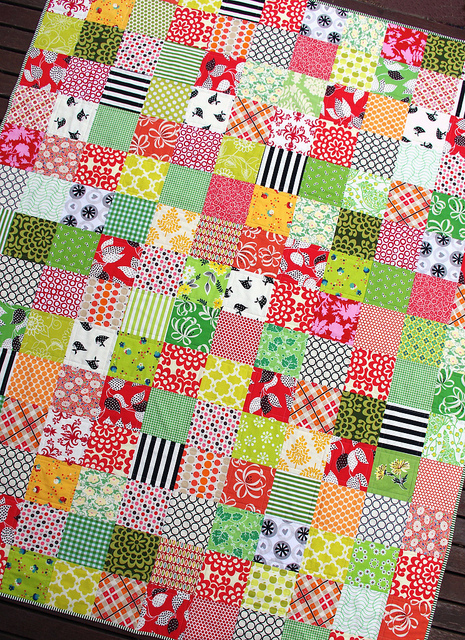 another gorgeous quilt....Lucky girls..such fresh, modern and happy colours. Love the fresh mix of fabrics!! As always Rita..Beautiful, fun, bold, bright, cheerful....perfect. I'm always sooo anxious to see what you do to the back of your quilts. Do you think you could do a tutorial sometime on piecing a back. Mostly what I'm wondering is how in the heck do you line up your blocks on the back with the blocks on the front?? Nice quilt. I like the black/white stripes!! 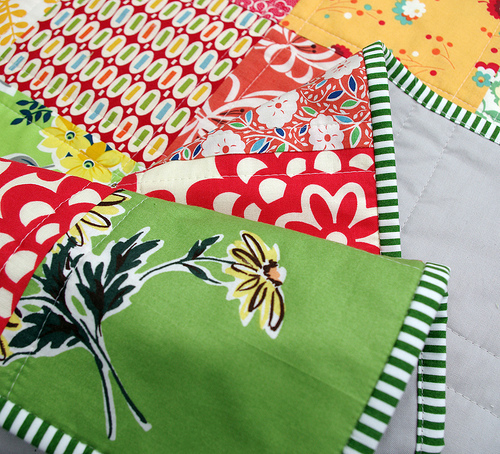 SEW beautiful - I have been checking out quilting bindings, I bet yours is just as colorful, as the quilt itself.